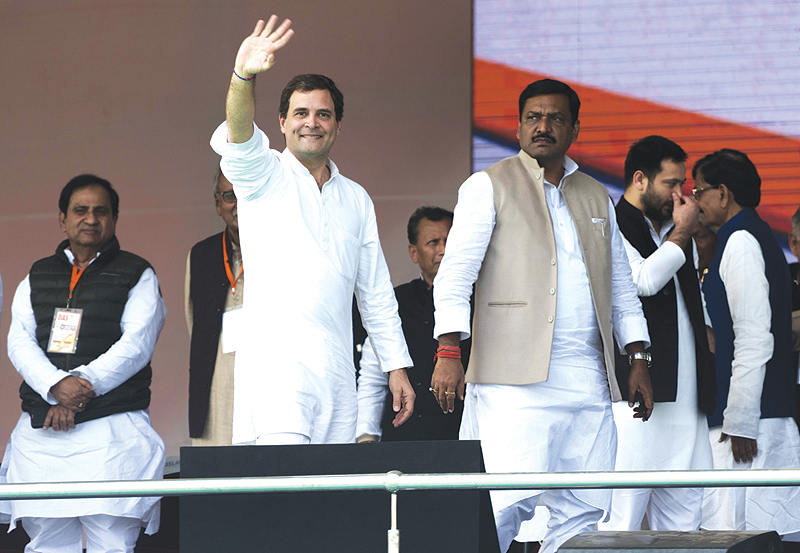 NEW DELHI: Prime Minister Narendra Modi is lording it over India just like the British, opposition leader Rahul Gandhi said in a blistering pre-election broadside published yesterday. Gandhi, great-grandson of India’s first prime minister after independence from Britain in 1947, Jawaharlal Nehru, hopes to unseat Modi in the vote due by May. “Every institution in India is facing Mr Modi’s autocratic backlash,” Gandhi, head of the Congress party that has dominated Indian politics for decades, said in a newspaper interview. “Mr Modi believes that he is the Lord of India, just like the British believed,” the 48-year-old told the Hindustan Times daily. Modi, 68, swept to power in a landslide in 2014 but with voters unhappy about unemployment and the dire state of Indian agriculture, winning again may not be so easy. Congress have been emboldened by state election victories in late 2018. Gandhi said in the interview that this was “just the tip of the backlash” against Modi’s Hindu nationalist Bharatiya Janata Party (BJP). “What Mr Modi doesn’t accept is that India today is in a crisis. India has a massive job crisis, a humongous agriculture crisis, and Indian youngsters are deeply distressed about their future,” he said. “This is generating a huge amount of anger.” Gandhi’s comments about Modi’s “autocratic backlash” referred to a massive row raging since Sunday between the central government and the premier of the eastern state of West Bengal, which has made waves nationally.